Municipal Solid Waste management is one of the most vital issues in the contemporary urban environments particularly in developing countries . The estimated quantity of Municipal Solid Waste (MSW) generated worldwide is 1.7-1.9 billion metric tons . In many cases, municipal wastes are not well managed in developing countries, as cities and municipalities cannot cope with the accelerated pace of waste production and waste collection rates are often lower than 70 per cent in low-income countries. More than 50 per cent of the collected waste is often disposed of through uncontrolled land filling and about 15 per cent is processed through unsafe and informal recycling . In Ethiopia, like developing country, the increase of solid waste generation is resulted from rapid urbanization and population flourishing. The amount of solid waste in Addis Ababa and other fast growing areas in the country has been increasing over time, largely attributed to rapid population growth rate. Moreover, it indicated that from the total solid waste released by the population in the city, about 50-60 % was collected and the rest was unattended . In many of the cities in Ethiopia, the municipality administration is responsible for waste collection. Though, there is a wide variation in performance in relation to waste collection in cities of Ethiopia, it has become a common business practice to have household waste to be pre-collected by individuals who are organized through formal or informal association. The pre collected waste is then transferred into containers which are then collected by municipalities. Nevertheless, in many cities there are not enough containers to cover the population and vehicles are typically under maintenance or out of service for long periods of time. When considering solid waste management in general, it should be noted that it is rather small fraction of waste that ever reaches dump sites or landfills in Ethiopia (Global Methane initiative, 2011). Indiscriminate dumping of wastes contaminates surface and ground water supplies, due to increasing environmental pressure and decreasing landfill capacity, prevention of MSW and promoting reuse, recycling and recovery are becoming more popular [5,6]. Dilla town, also facing similar problem due to mismanagement of solid wastes. The study was conducted in Dilla town, Gedeo zone, Ethiopia. It is located approximately 360 km south of Addis Ababa and 90 km from Awassa town, the capital for the Regional State. The main highway that connects Ethiopia to its' southern neighbor, Kenya crosses the town. Apart from this highway, there is good road network in the town to connect different parts of the town (FIG. 1). The landfill site is located at the northwestern outskirts of the town, far away from most of the populated area. The area surrounding the site is area designated for industrial zone. The site is located around 1km from Dombosco Catholic School, 2 km from Walleme village which is part of the Dilla town and adjacent to Dombosco School and 2.6 km from Dilla University. The site is surrounded to the north by Majage River (gorge) which is completely covered by forest, to the south and south-waste by industrial zone, to the west by farm land adjacent to the industry zone and to the east by trees and Dombosco fence. The total area of the Dilla town is 1123.47 ha based on the recent (2007) census data of Ethiopia, the city has a total population of 89,855 of which 47,195 were male and 47,660 were females. The total household count is about 12316 with an average of size of 4.5 persons to a household. The climate of the city is weyna dega, with a mean annual temperature of 200℃ and annual average rainfall ranging from 850 mm to 1358.6 mm. Purposive sampling technique was applied in the land fill site and collected nine samples from three stratified layer such as upper (1-2 meter), middle (2-4 meter) and bottom layer (4-6 meter). Finally minimum of 5 kilo samples were collected from each layer for further analysis. After the collection of 5 kilo waste from landfill site and subjected to sorting to determine the composite waste samples from each types of plastic bucket were spread and sorted into different types of waste components on clean plastic sheet. The component of each waste was measured with calibrated suspension 20 kg scale. Proximate analysis consist of moisture content, ash content, volatile matter and fixed carbon determined by put the selected sample to different range of the temperature, between 100°C to 950°C. The laboratory methods used to measure the proximate analysis of samples in this research was carried out based on ASTM standard. Ash content of waste represent the non-combustible residue left after waste burn, which represents the natural substances after carbon, oxygen, sulfur and water. Analysis was done with dried sample in a ceramic crucible at 750℃ for 1 hour . 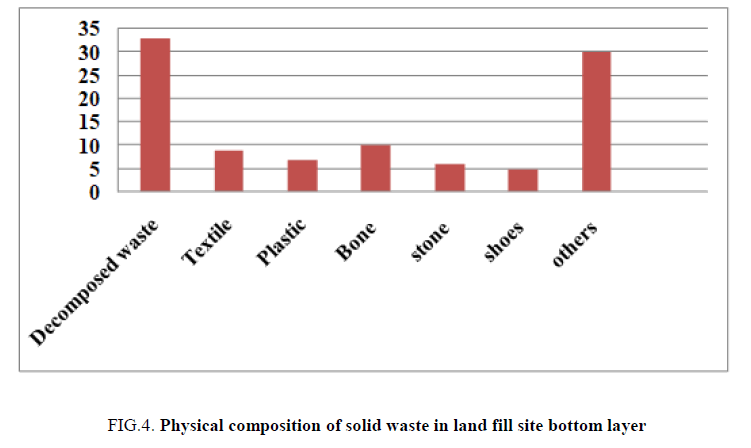 The physical compositions of the waste were analyzed and the results were indicated in FIG. 2. The results were revealed that 41% of the solid waste in the upper layer of the landfill site was demolish waste that come from constructions site and also there was 4% hazardous waste like syringe, 7% of waste composition was plastic and ash, 6% was old shoes and bone. Even though, the number of hazardous waste was less but its effect is comparatively very high when compared to other waste types that dispose to landfill. Because the site was exposed to scavengers which try to search old shoes, cloth and metals for sale. The existences of plastic waste in the layer reduce the biological degradation of organic waste which reduces the life span of landfill and decomposition of the waste . In the middle layer (FIG.3) of the landfill due to the compaction of the upper layer it’s difficult to distinguish wastes especial the organic one because of the decomposition. The highest percentage of soil particles (29%) were observed in middle layer as compared to other waste materials. However, in addition to this middle layer contain glasses, plastic and textile which have 6, 6 and 5% respectively, which have negative impact on land fill by shortening the life span of landfill and hinder the decomposition of solid waste which reduces the burden on the landfill by decreasing the waste volume. 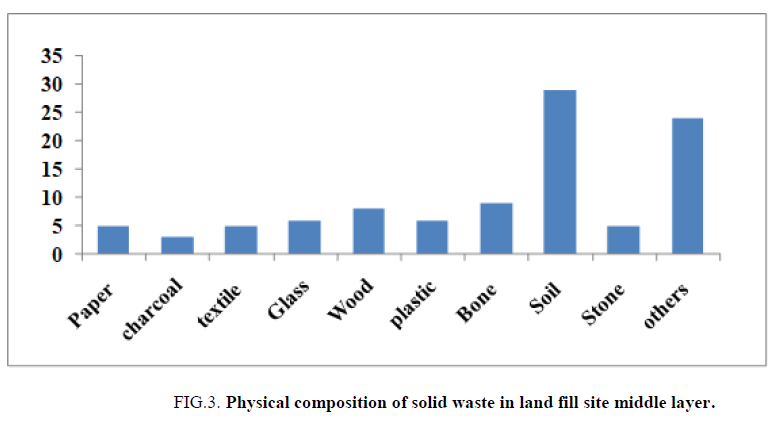 Figure 3: Physical composition of solid waste in land fill site middle layer. The physical composition of the land fill site results were agree with , in Palestine indicated that the bulk of waste was decomposed (organic) (65.1% by weight). In addition to this research was conducted by Nabegu (2013) in Kano metropolis, and in Nigeria, also indicates a predominance of organic and biodegradable matter 66%, which were slightly higher than present study. However, the physical composition of the land fill site influenced by the dynamics of their culture, the per capita income, the developmental changes in consumption patterns and waste disposal or recycling services in the municipality . Moreover, the waste composition at any landfill depends on different parameters, like waste legislations, differences in the waste management systems, recycling systems, standard of living and on society and culture . 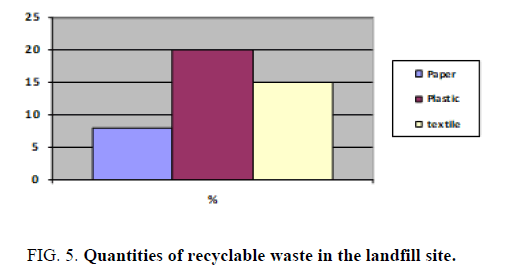 Total quantities of recyclable waste materials were analyzed in landfill site and the results were analyzed and indicated in FIG. 5. The results were revealed that, highest proposition of plastic waste (20%) as compared to textile and paper waste. The amount of plastic waste increased in the disposal sites. This plastic waste may be a kind of plastic film, typically used for industrial packaging, especially for food manufacturing. Plastic film can vary by resin and color; it may also be made of one layer of plastic or as many as ten layers depending on the complexity of the package and this is a main reason of increased usage of this type of plastic in industrial process. This is expected, increasing the population, migration and also industrialization during the past few years were the main reason for increasing the quantity of MSW. Glass and other materials had the small fraction of MSW in this landfill. High percentage of recyclable components show the landfill site has potential for provide the recovery facilities, for example “pyrolysis techniques”. The recovery process can be considered as one of the acceptable methods to handle and decrease the high volume of recyclable materials. Figure 5: Quantities of recyclable waste in the landfill site. The proximate analysis was done in landfill site (upper, middle and bottom layer) for moisture, ash, fixed carbon and volatile matter content were analyzed and the results were indicated in TABLE 1. As per the results, moisture, ash and fixed carbon content were increased with increase the depth of the landfill site was. Accordingly, highest moisture (41.9%), ash (16.90%) and fixed carbon (14.56) content were observed in bottom layer. However volatile content was more in the upper layer. High organic matter content in solid waste composition may be a significant factor which increases MC. Although this value seems high in comparison to the theoretical MC value of MSW, it is in parallel with previous studies . Table 1: Proximate analysis of municipal solid waste in land fill site. From the conducted research, the moisture content of the solid waste transporting Dilla landfill was about 25.61 - 41.9 %. Efficient composting process requires moisture content above 45-50%  while from some past studies concluded that waste with 50-60% moisture content was appropriate and efficient for composting . The highest volatile content was observed in the middle layer of the landfill site. The volatile solids of approximately 47.35% and demonstrates the high inert or inorganic content of the waste. The inert material is mostly dust, sand, and soil, and is a large fraction of the landfill site. The present study demonstrated that composition and characterization of municipal solid waste in landfill site in Dilla city, Ethiopia. As per the results different composition of physical waste materials were identified in upper, middle and lower layer of the land fill site. In the upper site physical composition showed the higher proposition of demolishes waste (41%) and lowest proposition of textile waste (1%). Likewise middle layer showed the higher proposition of soil waste (24%) and lowest one is textile waste (3%). In addition to this, highest amount of decomposed waste was observed in the bottom layer. Moreover, the quantities of recyclable materials in landfill site results revealed the, highest proposition of plastic waste (20%) as compared to textile and paper waste. As per the results of chemical composition, moisture, ash and fixed carbon content were increased with increase the depth of the landfill site was. However volatile content was more in the upper layer. In general, from the study results, large proportion of the generated wastes is either compostable or recyclable or energy can be reclaimed from it. Therefore, the municipality has to reduce a waste that goes to disposal site through composting, recycling and energy recovery techniques. Pattnaik S, Reddy MV. 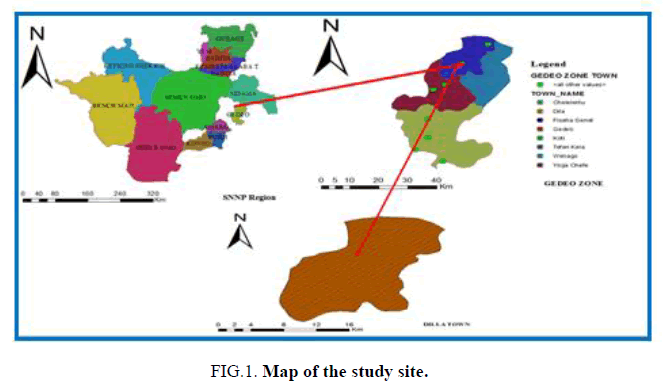 Assessment of municipal solid waste management in Puducherry (Pondicherry), India. Resources, Conservation and Recycling. 2010;54(8):512-20. United Nation Environment Program (UNEP), Framework of global partnership on waste management, Note by Secretariat, http://www.unep.or.jp/Ietc/SPC/news-nov10/3_FrameworkOfGPWM.pdf 2010. Chalmin P, Gaillochet C. From waste to resource, An abstract of world waste survey. Cyclope, Veolia Environmental Services, Edition Economica, France. 2009. Dawit W, Alebel B. Improvement of solid waste management in Addis Ababa, A participatory Approach (Draft). Addis Ababa, Ethiopia. 2003. Buttol P, Masoni P, Bonoli A, et al. LCA of integrated MSW management systems: Case study of the Bologna District. Waste Management. 2007;27(8):1059-70. Tseng ML. Implementation and performance evaluation using the fuzzy network balanced scorecard. Computers & Education. 2010;55(1):188-201. ASTM, Standard Test Method for Determination of the Composition of Unprocessed Municipal Solid Waste. ASTM Standard D 5231-5292. Reapproved American Society for Testing and Materials. U.S. 1998. Al-Khatib IA, Monou M, Zahra AS, et al. Solid waste characterization, quantification and management practices in developing countries. A case study: Nablus district-Palestine. Journal of environmental management. 2010;91(5):1131-8. Blight G, Mbande C. Waste management problems in Developing Countries. Solid waste management. Critical issues for Developing Countries. Kingston, Canoe Press UWI. 1998:11-26. Quaghebeur M, Laenen B, Geysen D, et al. Characterization of landfilled materials: screening of the enhanced landfill mining potential. Journal of Cleaner Production. 2013;55:72-83. Hui Y, Li?ao W, Fenwei S, et al. Urban solid waste management in Chongqing: Challenges and opportunities. Waste management. 2006;26(9):1052-62. Tchobanoglous. G.H, Frank Kreith. Second Edition Handbook of Solid Waste Management. McGraw - Hill, New York 2002. Philippe F, Culot M. Household solid waste generation and characteristics in Cape Haitian city, Republic of Haiti. Resources, Conservation and Recycling. 2009;54(2):73-8.